I understand decadence all too well. You might say it is the moral concept of this blog. 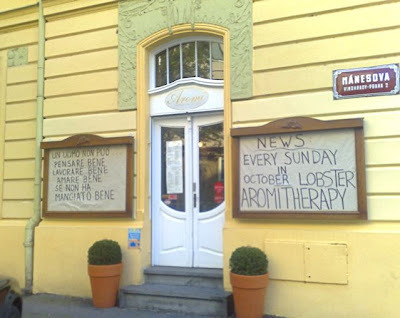 Case in point: On a recent weekend, V and I dropped by Stonehouse Massage Studio in Vinohrady for a joint rubdown. 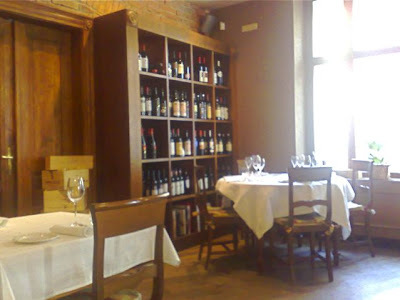 Feeling relaxed, and, okay, a little decadent, we glided a few meters down the street and stepped through the doors of Aromi, one of Prague's best Italian restaurants. We hadn't been there since last summer, but as I wrote in my post back then, we enjoyed it. As we walked in, they were preparing long tables for a party. I've occasionally walked by and seen large groups here, and once saw the whole place taken over for a company event. The interior has a warm, rustic feeling with dark wood floors, wooden cases filled with wine, tasteful funiture, and brickwork accents. 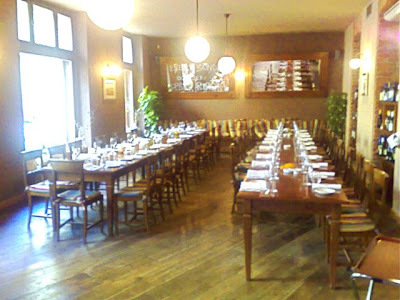 A large table stood in the middle of the dining room. It was covered with various liqueurs, chilled champagne, and opened bottles of wine. Very tempting. The waiter dropped by and dropped of some wonderful bread. 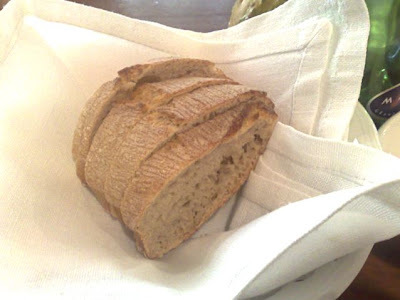 It had a crunchy crust and a medium-dense interior that tasted almost like sour dough. It went well with the strong olive oil and spiced nuts on the table. The late hour for lunch and our massages had sparked a serious hunger, so we consumed a good portion of these. There was an amuse bouche. A little bite of a cracker. The waiter asked us about drinks. We only wanted water -- sparkling for me, still for V. I was a bit annoyed when he came back with two large, open bottles of San Pellegrino and another pricey brand. "We didn't want that much water. Don't you have small bottles of Mattoni?" I asked. I got a lot of vitriol in comments about our last visit because I ordered beer with dinner and V ordered wine by the glass. Aromi has a nice wine list, but we were not in the mood for alcohol after our massages. So, please, no grief about the sad, missed oenophilic opportunities. 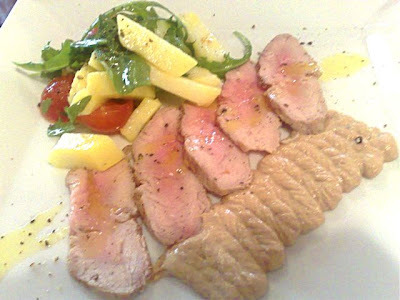 For a starter, I had vitello tonnato con insalata di patate or veal tonné with potato salad (285 CZK). Confession: I did not know what this was before I ordered it. Contrary to the expectations of some readers, I do not possess comprehensive culinary awareness. I know what I like, and I like what I know. I just figured I like veal, and I like potato salad. Why not? The meat was moist and tender, if a little bland. The potato salad came with rucola and great cherry tomatoes. It was nicely dressed with a good balance of oil and vinegar. What I didn't fully understand was that tonné meant tuna. I felt a little ignorant, so I read more about this dish later in someone else's blog post. The tuna is mixed with mayo, anchovies, and capers. The combination had a strong, fishy flavor and, I'll admit, I didn't love it. But hey -- my bad. Ignorance is not always bliss. For a main course, I tried something that sounded very intriguing -- ravioli di parmigiano fondente e tartara di manzo (265 CZK). 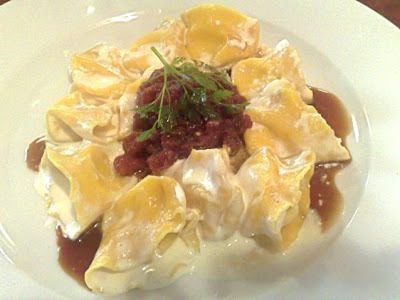 The pasta was filled with liquified parmagian cheese, and the center of the dish was filled with raw beef. The waiter recommended eating each ravioli whole, along with some morsels of meat. I did and understood why. Each spoonful turned into a tart cheese explosion in my mouth. I tried cutting one open, but this didn't work. The buttery, liquified parmagian ran out of the ravioli onto the plate. The tartare was not typical. The beef, about room temperature, was coarsely chopped and dominated cracked pepper. It was relatively bland compared with the strong cheese and added more texture than flavor when combined. 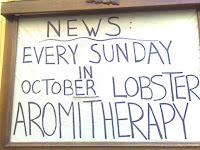 I thought it could have used a dash of vinegar, a shot of lemon, or perhaps some salt. Something. V ordered the coda di rospo ai due cavolfiori (475 CZK). 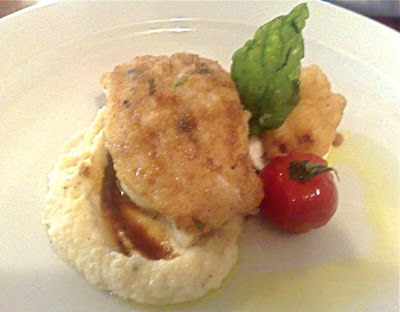 That's seared monkfish with two kinds of cauliflower. She liked it very much, but felt the buttery coating on top was not necessary. I thought the fish was a good, but a little on the bland side. We both liked the cauliflower puree underneath, and we both thought the fried iteration was a little too much like typical Czech fare. 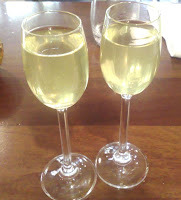 We weren't in the mood for dessert, but we were treated to two complimentary glasses of chilled limoncello. A sweet way to finish. 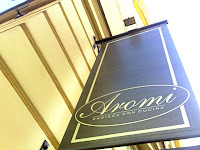 I know Aromi has become a big favorite among Prague foodies. Phil Carmmichael, the chef at Maze by Gordon Ramsay, said recently that the restaurant impressed him. So, if I didn't order the right dishes or drink the right beverage or demonstrate the right level of Italian cuisine expertise, please hold back with the terms of abuse. I didn't love everything about our lunch, but I did enjoy it. And I saw many nice and interesting-looking dishes going by our table that I'd like to try. So, we'll be going to Aromi again. That's all you critics need to understand. I missed the comments in the previous post about Aromi, so, if you don't mind, I will say something about the beer discussion. I think it is fair to criticise a restaurant for serving a liquid rubbish like Stella (or Heineken) when there are so many great domestic beers out there. 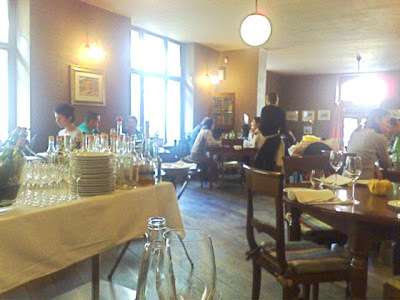 And it is also fair to criticise a top-end restaurant for offering only one kind of beer when there are so many different kinds and styles out there, both domestic and imported, that can pair with food every bit as well as wine. Now, criticising someone for ordering beer, or whatever, with the food they are paying with their own money is just stupid. It is like those snobs (many a food writer included) who believe that those who like their steaks well done are idiots. For the price, I think Mozaika still offers the best deal in Prague. And for the flavor vs. price ratio, you can pay nearly the same at Allegro but the flavors and presentation are phenomenally better. Actually, I think the Aromi La Bottega shop across the street is the real find, as opposed to the Aromi restaurant. I just wanted to say that your blog makes me 'homesick' for Prague. I lived there for 18 months back in 2001-2002, in Vinohrady, and wish I had the funds to make it back there. I loved the food there, and I see from your blog it is constantly changing. I miss the little neighborhood places (U Draku, and the Garden restaurant that closed across the street), and the beer. I mourn the beer. Thanks for keeping my memories alive! Aromi has been one of my favorite restaurants - but we had not been there for a while. My partner and I went to celebrate our ninth anniversary. We were seated and asked if we would like a drink. We asked for a minute to take a look at the menu. Our mistake. We waited 20 minutes for the waiter to return. 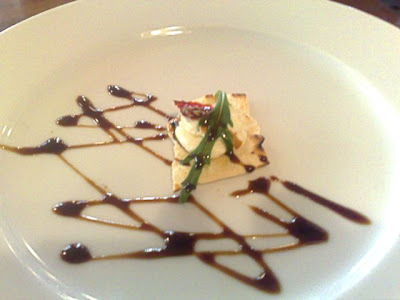 Then when we ordered, we received our starters before our apperatives. 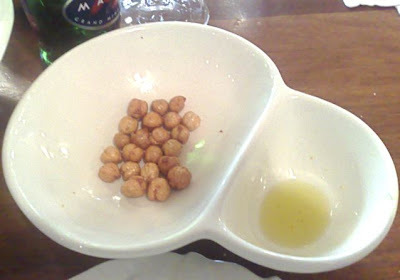 Then the wrong dish was brought out for the main - and we had to argue with the waiter. The problem throughout the evening was that we were not seen as important as some of the other guests. It was very disappointing We were even thinking of dessert, but after 25 minutes of staring at the menu, we were ready for bed.